Iconic British punk band Gallows are proud to announce the release of their new album ‘Desolation Sounds’, to be released through their own label Venn and Play It Again Sam Records this coming April 13th. 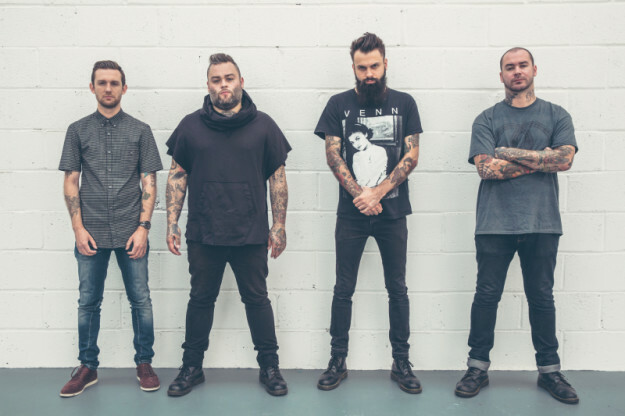 ‘Desolation Sounds’ is Gallows album number four. Titled after an expanse of water in frontman Wade MacNeil’s native Canada, it features ten songs, runs for 36 minutes and might just be the most bleakly beautiful, weighty and affecting collection of music you will hear this year. Prior to the album’s release the band will issue a new single ‘Bonfire Season’ as a digital download and 7” vinyl. Dark and foreboding, it finds Gallows wading into murkier waters. With a video shot by Canadian director and musician Josh Reichmann, his dark and foreboding film style perfectly suits the song’s menacing and heavy vibes, as previously showcased on the band’s video for the track ‘Chains’ in 2014 which Reichmann also created. 2015 will also see Gallows back on the road, doing what they do best, and they can now announce the following dates. Support will come from Nottingham based chaos merchants Baby Godzilla.